John died 21 June 1891 at Rochford, and was buried at the Lancefield Cemetery. It would appear that the family moved into Lancefield after John’s death, as the 1903 Electoral roll shows the family living at Lancefield. 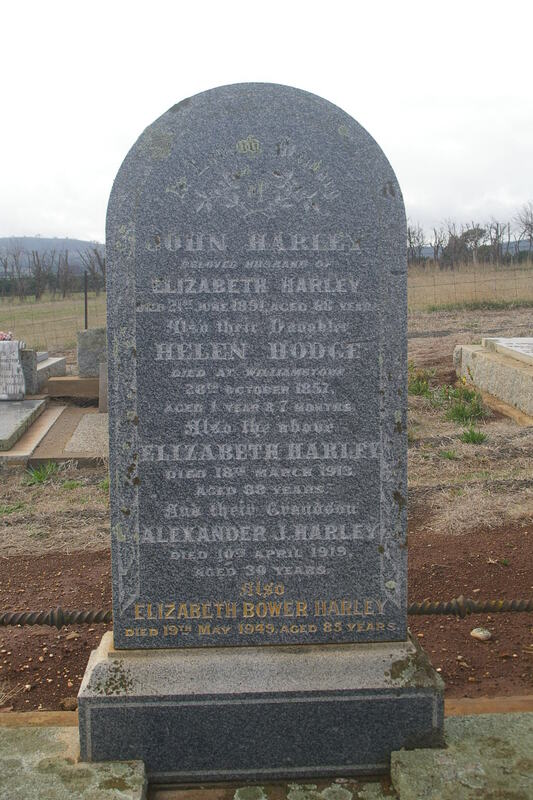 John’s wife Elizabeth died 18 March 1913 at Lancefield, and is also buried at the Lancefield Cemetery. John Harley born 1854, died 1924 at Lancefield. Helen Hodge Harley born 1856, died 1857. Alexander Harley born 1858 died 1931. More about Alexander and his family below. Agnes Moncur Harley born 1862 died 1922 at Lancefield. More about Agnes and her family below. Alexander and Ada later moved away from Lancefield. Alexander died in 1931, and Ada in 1959. Jessie Bower Hemphill born 1885 at Lancefield. Jessie never married. She and her other two unmarried sisters, Mary and Beatrice, moved from Lancefield between 1954 and 1963. Alexander Bower Hemphill born 1889 at Lancefield. He married Dora Emily Gould in 1921, and they lived at Lancefield until around 1949, and then moved to New South Wales. He died in 1963, and Dora died in 1966. Mary Hamilton Hemphill born 1891 at Lancefield. She never married. She lived at Lancefield until between 1954 and 1963. 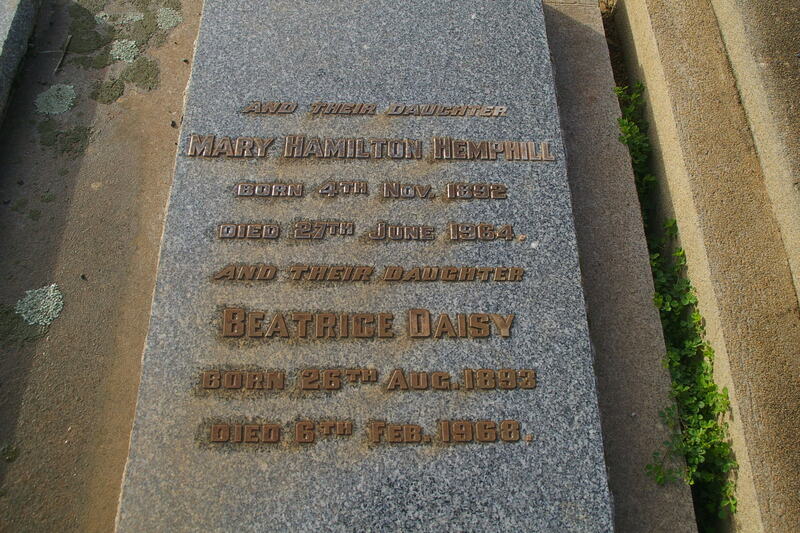 She died in 1964 at Parkville, and was buried at Lancefield Cemetery. Beatrice Daisy Hemphill born 1893 at Lancefield. She also never married. She lived at Lancefield until between 1954 and 1963. She died in 1968. She was buried with her sister Mary at Lancefield Cemetery. Laura Christina Hemphill born 1895 at Lancefield. She married Henry Arnold Barbour and they moved away from the Lancefield area. Laura died in 1966. Walter Robert Hemphill born 1898 at Lancefield. Walter, and his wife Florence, were living at Lancefield until about 1949. Walter died in 1969. Florence died in 1995. Agnes died in 1922 at Lancefield, and is buried at the Lancefield Cemetery. 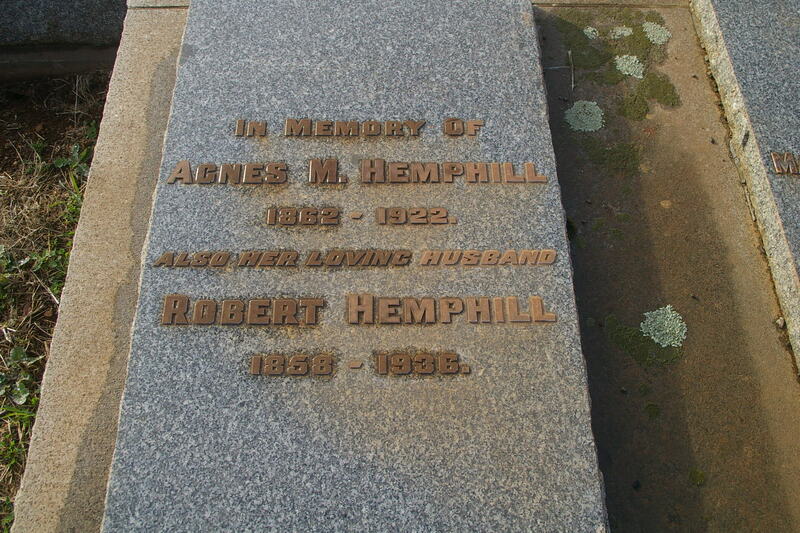 Her husband Robert Hemphill died in 1936 at Lancefield, and is also buried at the Lancefield Cemetery.